The March edition of Tabletalk is out. 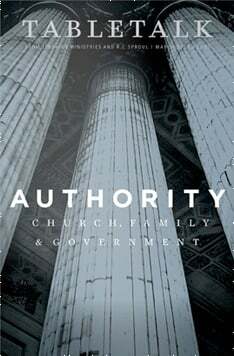 This month’s theme is “Authority: Church, Family & Government” The issue explains the importance of thinking rightly about authority as Christians. Contributors include R.C. Sproul with Knox Chamblin, David Mathis, John R. Muether, Matt Schmucker, Denise Sproul and Cal Thomas. “Says Who?” by R.C. Sproul Jr. If you have not subscribed yet, you should. It’s only $23 for a year, and $20 to renew. You save even more if you get a 2- or 3-year subscription (as little as $1.36 per issue). Special discounts for churches or businesses are available for those who want multiple copies of each issue. Start receiving Tabletalk by calling one of Ligonier Ministries’ resource consultants at 800-435-4343 (8am-8pm ET, Mon-Fri) or subscribe online.